PICPGM - THE LATEST PIC PROGRAMMING SOFTWARE SUPPORTING A LOT OF PIC MICROCONTROLLERS AND BURNING HARDWARES (winpic stoped further development, so try PICPGM) Also you could find a lot of other serial port and parallel port programming hardwares for both high voltage(hvp) and low voltage(lvp). Using bootloader is the most convenient way for PIC programming, especially when you are debugging your program and need to transfer it to the target PIC chipmany times in short time. The hardware request is that there is a serial communication interface implemented between the target PIC board and the PC. A bootloader is a small program that stays in the microcontroller and communicates with the PC (usually through the serial interface). The bootloader receives a user program from the PC and writes it in the flash memory, then launches this program in execution. Bootloaders can only be used with those microcontrollers that can write their flash memory through software. The bootloader itself must be written into the flash memory with an external programmer. 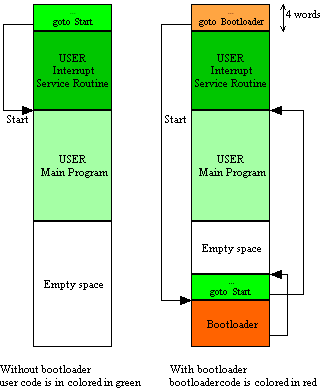 In order for the bootloader to be launched after each reset, a "goto bootloader" instruction must exist somewhere in the first 4 instructions; There are two types of bootloaders, some that require that the user reallocate his code and others that by themselves reallocate the first 4 instructions of the user program to another location and execute them when the bootloader exits.